As the first leaves start to change in Vermont, an excitement fills the air. The hot, humid days give way to crisp, cool temps, and residents and visitors scurry around enjoying the last few weeks of hiking, paddling, and camping before the snow flies. 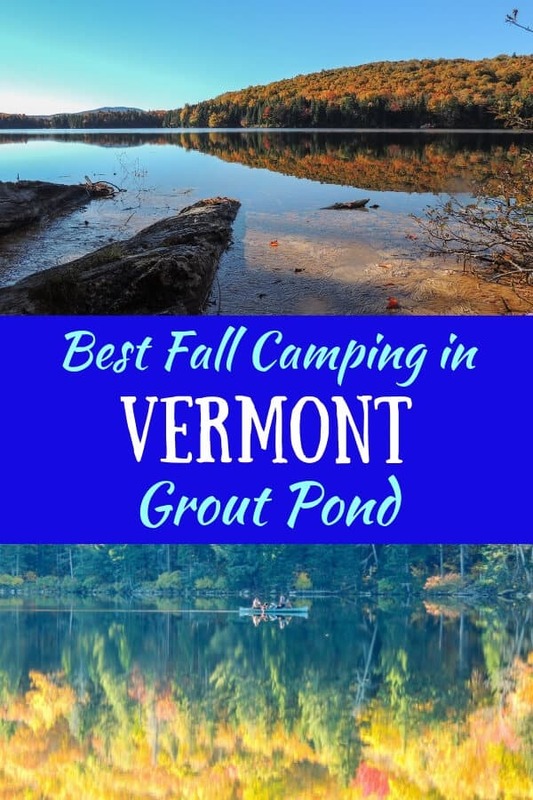 One of our favorite spots to take in the change of season is with a fall camping trip on Grout Pond in Southern Vermont. This picturesque pond is nestled in the mountains of the Green Mountain National Forest and surrounded by beautiful hardwoods. 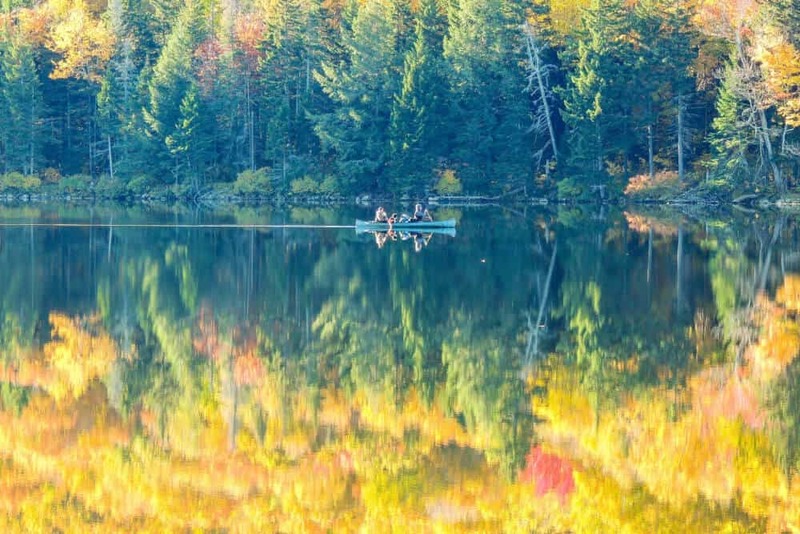 Paddling on Grout Pond is amazing in the fall! The Green Mountain National Forest is one of Vermont’s greatest treasures. It encompasses nearly 400,000 acres of rugged mountains, wild woodlands, and secret valleys in southwestern and central Vermont. It’s within a day’s drive of 70 million people, and I count myself lucky to be a close neighbor to these vast lands. Located in Stratton, Vermont, Grout Pond is a very popular summer destination. The small campground and parking lot fill up on most days, and while it’s worth the trip for a swim in those clear waters, a fall trip is all about the colors and the solitude. Grout Pond is an easy drive from Manchester, Vermont, as long as you don’t mind meandering on one of Southern Vermont’s most beautiful dirt roads. Kelly Stand Road begins in East Arlington, Vermont. It starts out paved, passing several homes and then seasonal camps along the Roaring Branch River. Before long, the road narrows and turns to gravel, crossing into the Green Mountain National Forest and running along a high plateau. No cell service up here, just a wild woodland, a rushing river, and beautiful fall colors! This little road is on of my favorites to explore in the fall. It’s 12 miles from East Arlington to Grout Pond, and slow going, especially if you’ve brought your camera. From Grout Pond, you can continue east to on Stratton-Arlington Rd. It’s another 6.4 miles to route 100 in Wardsboro. From there you can take route 9 east and route 7 north back to your starting point. Camping at Grout Pond in the fall is delightful for many reasons. First of all, there’s a very good chance that you’ll have your pick of the 18 campsites available, even if you visit on a weekend. 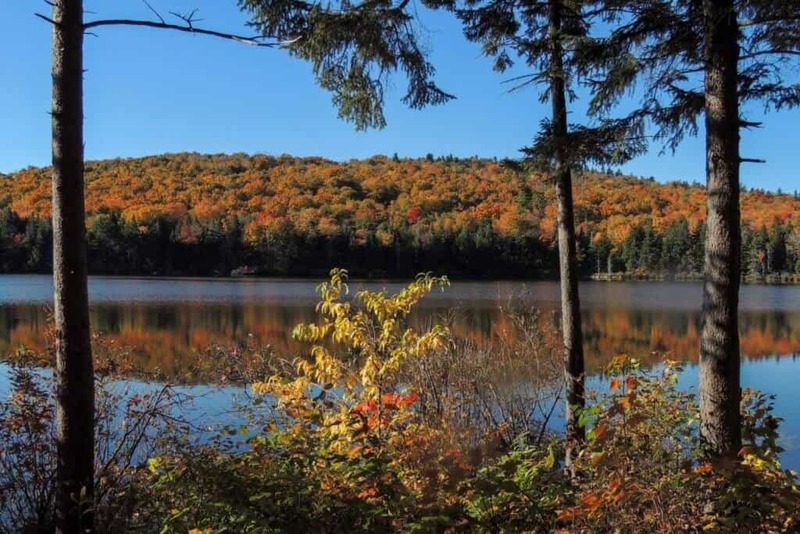 You’ll have the trails and the pond to yourself, and can meander along the hiking trails, photograph the gorgeous fall colors, and paddle around on the glassy pond. 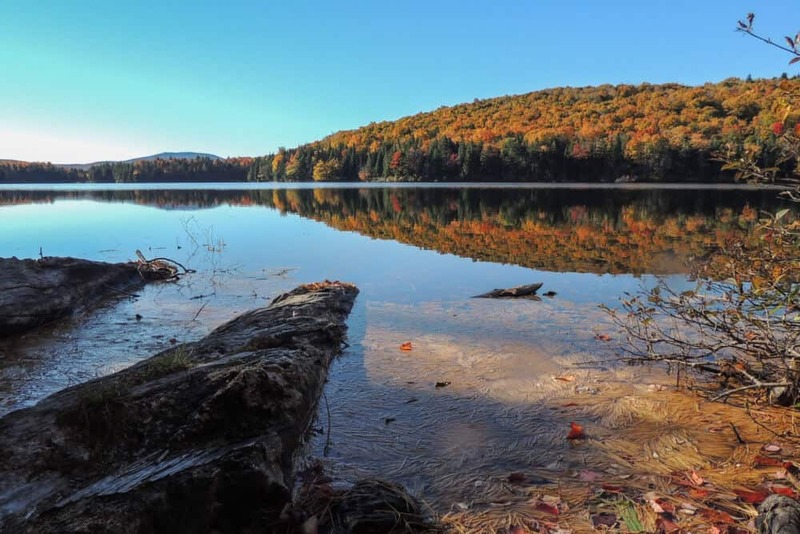 Of the 18 campsites available at Grout Pond, seven are near the road for car camping or RVs. Five more sites can only be reached by foot, and six sites can be hiked or paddled to. We really love site #2 for the awesome views and proximity to the water and toilet, but all the waterfront sites are pretty amazing. Site #11 is the last one on the trail, and very private. The hike to the #11 is about a mile, and paddling your gear out makes things much easier. If you’re paddling in, you can unload all your stuff in the day-use area, and then park your car in the lot. It’s an easy 5-minute paddle to most of the sites, and there are lots of well-marked trails to explore. 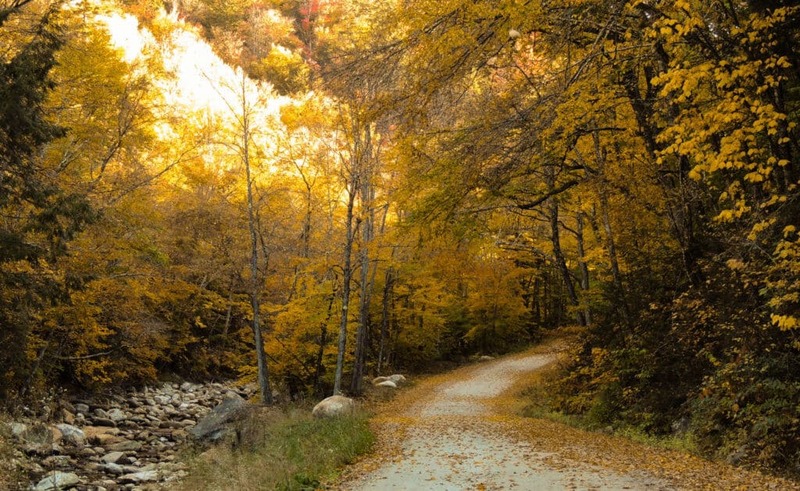 Our favorite is definitely the 2.6-mile pond loop trail. It is relatively flat, provides the best foliage views, and was great for our dogs, who didn’t mind swimming in the cold water. The only drinking water is in the day-use area, so I recommend bringing a filter so you can drink right from the lake. All tents must be set up on tenting platforms, so a smallish tent is a good idea. Sites 10 and 11 have two platforms and can accommodate larger groups. The campground is open year round. Sites can’t be reserved and are $16 per site. 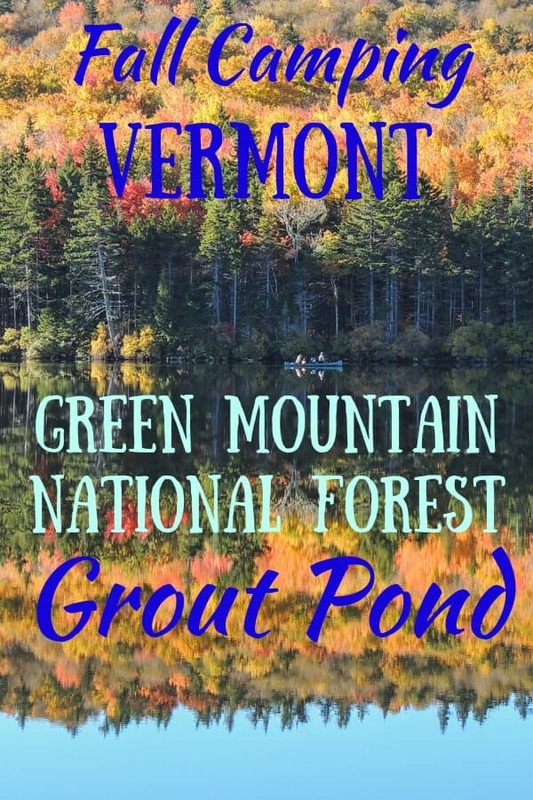 Grout Pond is in Southern Vermont, but it’s also in the mountains, so you can expect unpredictable weather. We have experienced 70 degree days in October, but also nights that are well below freezing. Rain is common, but so are beautiful sunny days. Your best bet is to pack lots and lots of layers, your warmest sleeping bag, rain gear, and soup. You can leave the bug spray and bathing suits at home. As for foliage, most of these photos were taken in 2016 and 2017, between October 5 and 15. The leaves usually start to turn by the first weekend in October, and by October 20th, they have all fallen to the ground. I would suggest coming on the earlier side, as you have a better chance of experiencing warmer nights. Grout Pond Recreation Area in the Green Mountain National Forest is one of our favorite spots to experience fall foliage in Vermont. 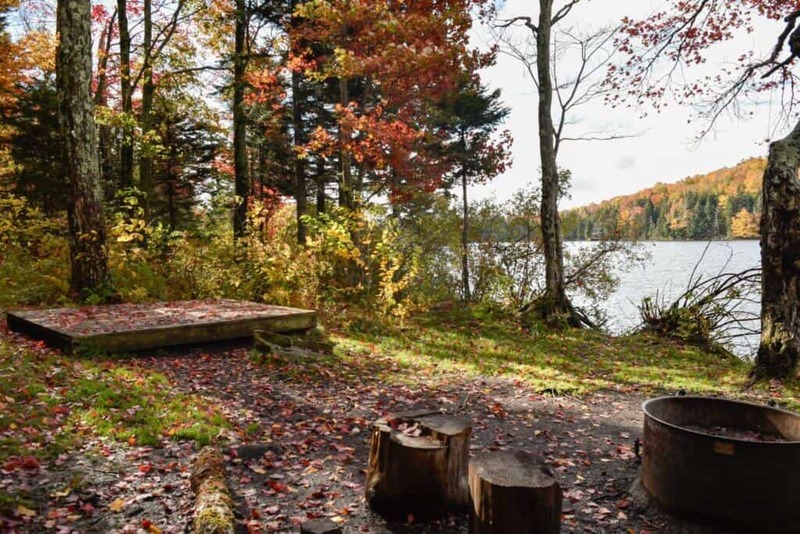 If you aren’t into camping in cold weather, you can still visit Grout Pond on a day trip from Bennington, Manchester, or Wilmington. Here are some of our favorite posts for exploring Southern Vermont. GPS is great and all, but I’m a huge proponent of using maps for exploring, especially as a hiker and a photographer. I highly recommend getting the Green Mountain National Forest Maps put out by National Geographic. The bundle includes the northern and southern sections, which will help you explore a huge variety of back roads and trails. The maps are waterproof, tear-resistant, and include trails, campgrounds, and points of interest. Indispensable. As a companion guide, I’d also recommend Hiking Green Mountain National Forest: Southern Section, which is a great guide, but also a story about the history and geological features of the area. Hi Tara. 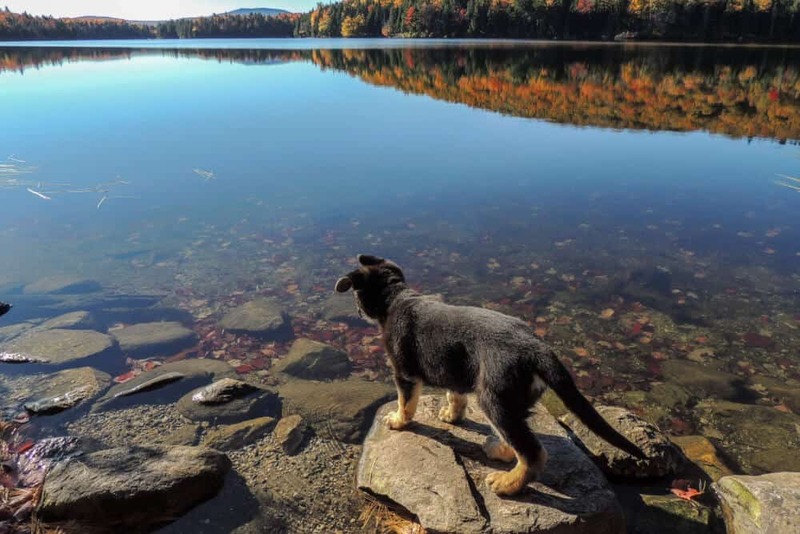 This is invaluable information for anyone wanting to hike with their dogs in Vermont! I wish I’d found your blog before my trek on the Long Trail with my girls!